A first view through Google Mars 3-D of a historical Mars map made by American astronomer Nathaniel Green in 1877. Armchairexplorers can now spy on Mars orbiters and access raw spacecraft data from NASA— part of a new "Live from Mars" update for Google Mars 3-D.
NASAand Google, Inc., joined forces to launch the Mars add-onfor the popular Google Earth platform in February. The March update includesnew features such as watching orbital tracks of spacecraft in real-time,peeling back historical globe maps of Mars and taking a guided fly-aroundtour of the red planet. "Asexciting as the initial release of Mars was [in Google Earth 5.0], it was difficultfor some users to figure out," said Michael Weiss-Malik, product managerfor Mars in Google Earth. Checking out a friend's house on Google Earth is onething, but trying to navigate the canyon system of Valles Marineris representsa bigger challenge. Nowconfused or disoriented people can get their Mars bearings courtesy of aplanetary tour narrated by Ira Flatow, radio host of NPR Science Friday. Boldernetizens and researchers can look forward to getting new Mars data almostimmediately from orbiting spacecraft, sometimes within a few hours of thedownload to NASA. "It'sas raw as it possibly can be," said Noel Gorelick, tech lead for theGoogle Astro team. Such data looks nothing like the processed, cleaned-upimages which already provide Google Mars 3-D with its sweeping views, butGorelick noted that researchers might get a preview of information to come. This"Live from Mars" feature included in the update should only encounteroccasional delays in getting new data, such as when NASA's Mars Odyssey orbiter had toreboot recently. GoogleMars 3-D users can already go instantly to the location of certain NASA landersand rovers. But the update also provides real-time tracking of Mars orbiters,and allows users to anticipate what the spacecraft might take pictures of nextalong their various paths. Thosewanting a different view can sift through older maps of Mars, which holdhistorical interest rather than scientific accuracy. 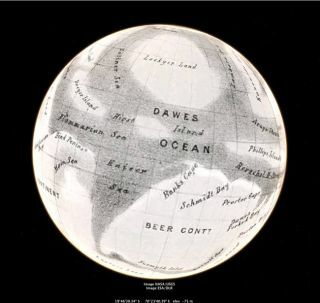 An early map by NathanielGreen from 1877 includes notable early features such as the "BeerContinent," named after German astronomer Wilhelm Beer. GiovanniSchiaparelli's famous map from that time period is also available, includingthe mistranslated "canali" that encouraged decades of speculationabout canals crisscrossing a Martian civilization. Google'steam hopes that NASA will increasingly use Google Mars 3-D as an informationplatform, and maybe to plan out future steps for missions such as the MarsExploration Rovers Spirit and Opportunity. "TheRover team was by far the most interesting response," Gorelick told SPACE.com. "They were kind of jumping up and down about how cool it was." BothWeiss-Malik and Gorelick represent ex-NASA science team members who broughttheir interest in space to Google. They scraped together willing engineers andprogrammers to create Google Mars 3-D during their "20 percent time,"which Google provides to encourage employees to pursue creative, independentside projects. Examples of products created during "20 percent time"include the widely-used Gmail feature. Theupdate should hopefully allow users to contribute more information to GoogleMars, just as they already provide most of the new information in Google Earth. "Wewant to reach a tipping point where external contributors are contributing mostof the content," Weiss-Malik said. "As far as I'm concerned, that'swhen we'll have achieved success."